Description: Perfect choice for those who don’t want to drive up the night before. Spend two days whitewater rafting, 1 night of camping out, and enjoy 4 gourmet meals, all at our own private campground right on the river. Just drive up the morning of your trip and meet us at 10:00 AM. 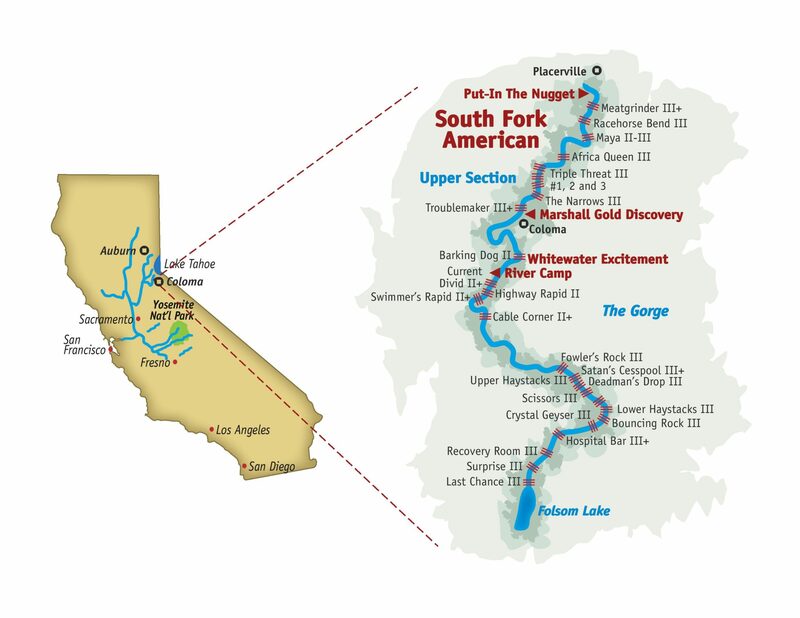 Our South Fork American River Standard 2 day trip is a 21 mile adventure that covers 2 days. We raft the lower Gorge section of the river the first day and the Upper Chili Bar section of the American river the second day. Itinerary: Arriving at our private riverside campground at 10AM the day of your trip, our guide staff will check you in for the day of rafting, and answer any questions that you might have about your American river rafting adventure. After checking in at 10:00 AM we will take a short bus ride to the launching area, your guides will help you with the required river gear and give you a river safety orientation. Then we split up into groups, assign the guides and push off onto the South Fork American river. The trip begins with some bouncy water to warm you up for the afternoon session of big rapids. We stop for lunch where your guides will prepare your riverside buffet lunch. Bathrooms are available during the break. The afternoon section, called the Gorge Run, begins with some bouncy whitewater and even an out of boat experience through “Swimmer’s Rapid” a fun, small wave train that leads to a huge pond to recover in. A fun way to cool off in the hot summer. Then the river builds and enters the “Gorge”, where the rapids come almost in non stop fashion for 6 miles. Rapids like “Satan’s Cesspool”, “Bouncing Rock”, and “Hospital Bar” are only a few of the exciting rapids you will encounter in the Gorge. After finishing the Gorge, our busses will meet you with cold drinks and a snack for the 30 min bus ride back to camp where you can clean up, relax a bit, and get ready for hor’dourves and a hearty BBQ dinner served by our camp cooks and your guides. After dinner we will have dessert and a slideshow of you rafting through some of the big rapids of the day. Then it’s off to you camp area and a relaxing time by the campfire before turning in for the evening. The next day again brings breakfast at 8AM and a 30 min ride up scenic Highway 49, the Gold Country Highway. We’ll pass by Coloma State Park, where gold was first discovered in 1848 by James Marshall. Arriving at the launching area, we again give you a refresher on our river safety talk, board the rafts and tackle the Upper Chili Bar section of the South Fork American river. Just downstream is our first class 3 rapid, “Meatgrinder”, the longest on the river (not the biggest, though). The morning session is packed with rapids that will challenge and thrill you, the last of the morning will be the famous “Troublemaker Rapid”. After Troublemaker, we relax in a more mellow section for about an hour, then pull off at Coloma State park and your guides will prepare our buffet deli style lunch with all the trimmings. Then have a lazy float back down to camp to finish our journey on the South Fork American river. At the end of the day, we will have waiting for you cold drinks and snacks at the meeting area, where again your guides will be there to thank you for coming and give you photo coupons good for money off your rapid photo purchase (if you wish). Skilled, professional guides, camp hosts, and camp cooks. Wetsuits and splash jackets for Springtime trips – (if needed). Lunch and dinner on day 1 / breakfast and lunch on day 2. 1 night of camping at our own private riverside camp area. Bathing suit/trunks, lightweight, quick drying top (rash guard works well). Lightweight windbreaker for cool mornings, sweatshirt for cool evenings. River sandals or old tennis shoes work great (No flip flops or bare feet allowed). Sunglasses (suggest retaining device so they don’t end up in the river). Waterproof sunscreen and lip protection. Bottle of water (drinks provided at lunch and end of the trip). Inexpensive waterproof camera (professional pictures are taken at one of the rapids). 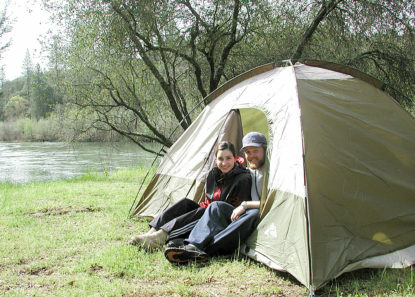 Or rent one of our 4 person dome tents or deluxe cabin tents that sleep 4. Sleeping Bag, pad, and pillow. Camp clothing (dry shoes, long pants, shorts, shirt, sweatshirt or light jacket). Food and drinks ( that are not provided on your trip). Campfire wood (we have a limited supply in our camp store). Pets, fireworks, high pressure water guns or firearms.